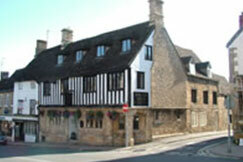 The Angel at Burford is a 16th century coaching inn. 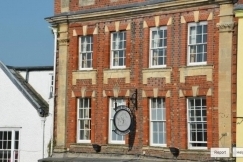 ideally located for a quick pint, a quality meal, or a welcoming break away. We pride ourselves on giving a warm welcome to all, including families, children and dogs, and ensure that whatever your reason for visiting us, you will always want to return. Our restaurant has been awarded an AA rosette, and our three rooms are rated AA 4 star. 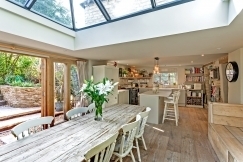 Stay Cotswold specialises in luxury holiday cottages and lettings in the Cotwolds. 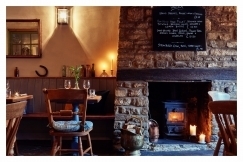 We have an extensive knowledge and a passion for everything the Cotswolds has to offer. Our four core cornerstones are: excellent service, intelligent marketing, a luxury property portfolio and of course a focus on the Cotswolds. The Highway Inn mixes original character with modern touches, including free wi-fi and 11 newly refurbished en-suite rooms. 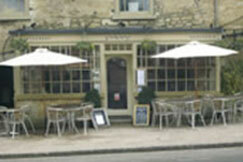 The Inn has a popular restaurant and newly refurbished bar and open for Breakfast, Lunch and Dinner. 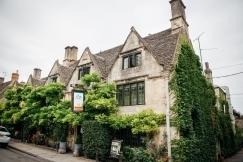 The Burford House boutique hotel offers six beautifully presented ensuite bedrooms. Dine in the ambient Little Italian Bistro and enjoy a drink at the bar or in the charming courtyard garden. The phrase 'charming old inn' is used much too freely, but the Lamb has a genuine right to it. The Lamb is everyone's dream of what an ancient English Inn should be, but with modern comforts, excellent service and award winning food. Outside there is a stunning courtyard and walled garden, ideal for dining al fresco in the warmer months. We are open 7 days a week from 9am until 6pm serving breakfast, lunch, cream teas and early supper including a traditional roast on Sundays. We are fully licensed and welcome children. The charming and picturesque garden located at the rear of our 17th century building offers a wonderful place to eat and drink with family and friends. Just a 2-minute walk from central Burford, The Bay Tree Hotel boasts 21 stylish, individually-designed bedrooms. The hotel is brimming with character throughout; with a higgledy-piggledy layout, flag-stone floors and log fireplaces. The bar and restaurant are open daily serving morning coffee, lunch, afternoon tea and dinner – dogs are welcome too! At the back you’ll find a lovely country garden with croquet and deckchairs. 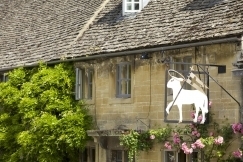 The Bull at Burford is a 15th century inn situated on the High Street of this sometimes bustling – sometimes sleepy market town. 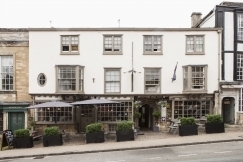 With all the expected wonky floors and creaky floorboards, The Bull shows its extensive history in every nook, but has now been brought firmly into the 21st century with a brand new bar and wonderful restaurant. We serve an AA awarded breakfast and modern menu, plus all the classics and desserts you need to save room for!